A couple of weeks ago, I was trying to change out my van seats. Our YWAM van has big, stupid, heavy seats. John, my friend who was visiting us, would not help me lift the seat. He told me he would get his teenage son to help get the seat in. I inwardly pshawed at John thinking it'd be quicker to just throw it in myself. I picked it up and felt electricity wrap around my back that left me helpless for the next two days. John is wise. I am dumb. Have you ever been to Nepal? I haven’t. Word on the street is that if Bob Seger ever gets outta here, that’s where he’s going. I knew a girl who went to Nepal once. She went by way of the classic Youth With A Mission story. 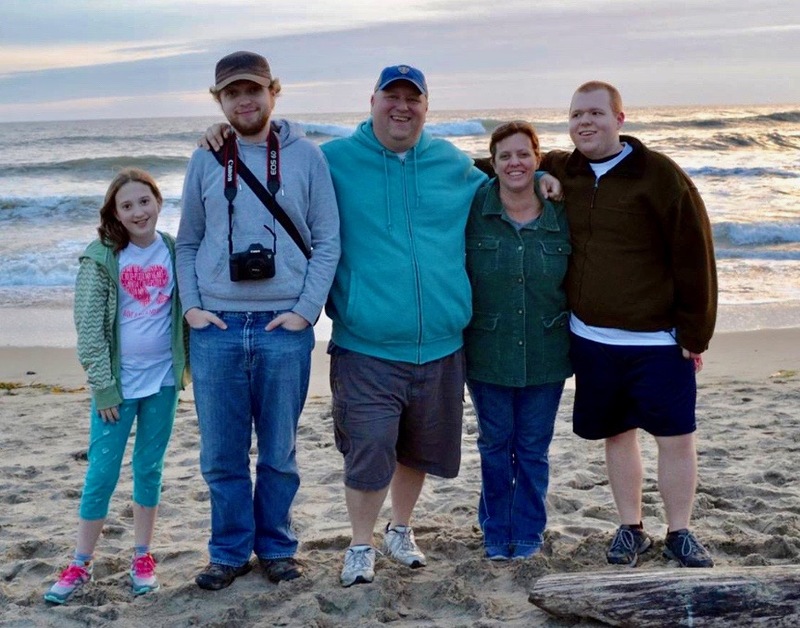 A team was going on a missionary journey to Nepal and she knew she was supposed to go with them. She had no money, even up to the day they were leaving. In an act of faith that I would have for sure shrunk back from, she rode along with the team to the airport with bags packed. At the last minute, she got a call on the airport courtesy phone that someone had purchased her a ticket. She went to Nepal. Nepal was the subject of my first time in a YWAM style prayer meeting. We call it ‘intercession’. I believe it was the first morning of my Discipleship Training School in 1990 and all the YWAMers in Tyler, Texas had gathered for prayer together. In these times, we began to practice a progression of prayer that followed a set of biblical principles to help lead us as a group. Several hundred of us sat in smaller circles around a gymnasium and prayed together for God to help the nation of Nepal. Something magical happened. In that short hour, I began to feel God’s feelings for the people of Nepal. It’s like he gave me a tiny taste of his love for them. I began to cry. I was caught up in a swell of emotion that I didn’t know what to do with. Afterward, I even felt a little embarrassed. I don’t know if I had ever even thought about Nepal before and here I was, experiencing deep feeling for the people. It was a little intense for my first day. We Christians can be smug sometimes when we talk about having a ‘burden’ from the Lord. We tout it like it’s such a cool thing to carry a heavy burden for “the lost” or “the poor”. We wear our service, our work, like a badge of honor. But Jesus says to learn from him. His burden is light. No need to brag about how much we carry. We can find rest in him for our souls. I think prayer or intersession is the place we learn to let God do the heavy lifting. 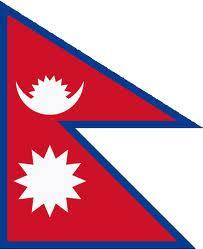 I may never go to Nepal, but God can let me in on his heart for the Nepalese in prayer. It’s not up to me to do great things. God does great things and sometimes he takes me along for the ride. We just have to keep close to his heart. God is more committed to making the world a better place than you and I. And he uses us in the process if we let him. What is it like to have a heart that stretches around the world? How does God see all the injustices, hear the cry of the desperate and still have love and hope to carry us all? I don’t know. I don’t have to know. But I want to be close to a heart like that. We get there by prayer. I don’t use a lot of words in prayer anymore unless I’m praying with others or if I’m writing. Simple liturgical prayers or silence are fine by me. It seems that God doesn’t really speak English. He speaks heart and can understand it no matter what language we use. I can go talk to a mountain all I want to, but to really understand it, it’s probably better to just lay down on it. To know the sea, you have to go sit next to it, walk along it and let the water wash your feet. There are many other ways to pray. THIS ONE has been especially helpful to me. If you’d like to read YWAM’s principles of intersession, you can find them HERE. How have you experienced God’s heart in prayer? Did that ever lead you to an unexpected place doing unexpected things? My introduction to fiction written by Christians was sadly not “The Hobbit” or “The Chronicles of Narnia”. Neither of these really grabbed me as a child. My parents were not particularly readers, it’s not something I saw too much in the house. Maybe they were ‘behind closed doors’ readers or maybe I was oblivious but I do not remember reading as part of the culture of my family. Books were though. My Dad was a collector of antiques and curiosities. And if that makes you think of my childhood home as looking a bit like a museum, then you’ve got the right picture. In our back family room, Dad had an entire wall made to be a book shelf. It was filled with hundreds of old, dusty volumes of poetry, history and I think four copies of the complete works of Shakespeare. Dad bought books for how they looked. My Dad has a bit of the flair for the dramatic. In front of the book shelf was his half grand piano and a carved wooden writing desk complete with inkwell and quill. On the bottom row of the bookshelf were about 500 LP records. In the 80’s, cable TV had not yet reached the channel capacity of today’s 5,348 and counting (remember the song “57 channels and nothing on”? That was supposed to be hyperbole! Ha! ), so in the summer, if I did not want to watch a soap opera, my other option was to walk up to the library. We had a little local branch around the corner from us that was quaint and air conditioned. It was here that I learned to love reading. I think I read every Encyclopedia Brown story at that library. I am happily rediscovering these kinds of stories by reading their source material in Sherlock Holmes. I would stay up late, scarred out of my mind reading books about UFO sightings and big foots (big feet?) and other unexplained phenomena. The first “Christian” fiction I ever picked up was a book called “The Tower of Geburah”, a children’s fantasy novel by John White. I did not know at the time that this series was an homage to Lewis’ Narnia that Mr. White wrote at the request of his nephews and niece. Delightfully, he put them in their own adventure story and I was caught up in it too. I recently re-read the first book with my son and I enjoyed it again (probably my 4th reading or so) but it definitely doesn’t have the staying power of Narnia, which I found later in life. Then, when I was a teenager looking around the Bible book store, there was a book on the bargain table that caught my eye. 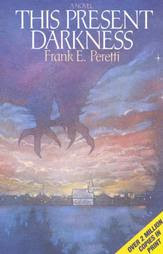 It was called “This Present Darkness” by Frank Peretti. It was on clearance. I picked it up strictly because of it’s cool name and cool cover. This book had not yet become the famous, landmark work for Peretti. I, or any one else it seems, had never heard of it. I bought it. I may be the first person ever to buy that book. I like to think that I discovered it. Well, I opened it and like many, many others, could not put it down. It was fast, exciting and scary. It opened my imagination. I ate it up. About a year later, this book blew up and became a best-seller and it’s own culture in the American Christian scene. I haven’t read it since. I remember not liking the sequel as much but it was every bit as popular as the first. A friend of mine used to say, “In the 70’s, people knew you were a Christian if you were carrying around a large ‘Good News Bible’. In the 80’s, it’s a copy of Frank Peretti’s books”. If you’ve never read it, it’s about a small town church congregation that is caught up in a high stakes spiritual battle of which they are mostly unaware. We see the story unfold in the physical world and in the spiritual as angels and demons fight to influence human lives. After this book hit, Christians began discussing ‘spiritual warfare’. People started to see their life as a battle. ‘Warfare’ prayer and songs became quite common in Christian meetings. And there were reactions and warnings to not let fiction influence your theology. It was a big deal. Recently, I was at the movies with a couple of friends and we were standing in front of a poster for the next Christian outreach film coming to one or so theaters within a hundred miles of you. This is a “message” movie. I know, because the poster tells me what the message is. I don’t even need to see this movie to know what I’m supposed to get out if it. This movie wants me to be a better Dad. I don’t know if this movie is good but it got us to talking about stories and why it seems that Christians have a hard time writing or telling good ones. I think it’s because we start with the lesson and work our way backward. I don’t think Peretti started with the idea that he wanted to teach us all about spiritual warfare. I think he wanted to tell a good story. I think he liked scary stories and thought it’d be cool to write a scary story about angels and demons. It seems in a lot of Christian story telling, the story is secondary to the message. You may be saying, “Of course we start with the lesson! We do it because Jesus did it. He told parables.” Yes he did. And I like parables. Parables are short. Most of them take about 2 minutes to read or hear. Some less. It’s a small message in story form told to open our eyes to (or hide...which is confusing I know but Jesus said it, not me) a spiritual truth. The people hearing the parables came to hear a message. Parables work fine in that context. I love it when preachers use parables instead of just lecturing. It’s way less boring. A 90 minute or 300 page parable is boring. Why? Because you feel the sell. If you sense the ‘message’ early on, your mind puts up walls to it. Stories are supposed to ignite imagination and take us to another place. Stories help us recover something that gets stolen by the false world around us. Stories remind us of what’s true. But if you start backward from the ‘message’, it seems harder for the story to work it’s magic, not impossible perhaps, but harder. Lewis, Tolkien, L’Engle, King, Grisham, Lawhead, Rowling and many others have all written distinctly ‘Christian’ and enormously popular stories. What makes them different than ‘Christian’ fiction or movies? Do you have a favorite book/movie? What makes a story work for you? On and off, for about the past 12 years or so, I have flair ups of gout. 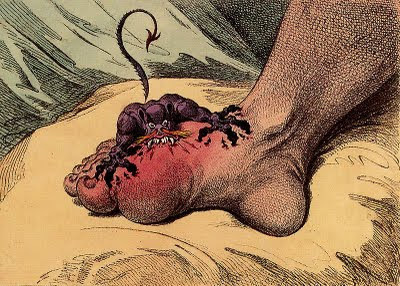 It’s a little embarrassing as gout is a disease people think of as something 18th century British waifs get as they sit begging on the side of a cobblestone road in a Dickens story for a few tuppence or an old apple as they cry out, “have mercy on me, I’ve got the gout, Gov’ner!” (cough, cough). In the Winter of 1991, on a 24 hour drive from Romania to Germany, I shivered in the 2nd bench of a VW microbus stuffed with way too many team members and our luggage. I had a fever, diarrhea and was the most uncomfortable I had ever been in my life. I remember running to a toilet on the hungarian border only to find the strangest looking contraption I had ever seem. There was no place to sit on an elongated type bowl that resembled a banana seat on a kids bike from the 70’s. It seemed you were supposed to straddle it. I had no strength so I just sat down on the thing. Sorry for the visual, but I was miserable. That would make a good line in a rap song like all the kids these days seem to enjoy. We made it to Germany and were staying at a church in Augsburg. I quarantined myself in the church basement and writhed on the floor in an unparalleled agony for a couple of days. I had massive sores on my head, a scorching fever and could not eat. I was miserable. I slept on the whole plane ride home. Turns out, I had caught impetigo from the orphans we were working with in Romania. Some thanks, eh? We get sick. I don’t know why. My friend is in agony in the hospital right now with a strange spinal issue that some of the best doctors in the country can’t figure out. Dear friends, who last year went for broke and moved to Thailand to work with street kids had their whole world pulled out from underneath them (the mission they went to serve was not a relational or philosophical fit), then they got the joyful news of a new pregnancy that has laid the wife in bed with sickness for about 10 or so weeks now. They are confused and coming home to uncertainty, in need of all kinds of healing, housing and fresh direction from God who doesn’t seem to be making the way too clear at the moment. Another friend who was in YWAM with us continues to suffer with undiagnosed pain that puts her out of commission more often than not. We pray for healing. Sometimes things get better, sometimes they don’t. It’s hard to understand. Looking back on that trip to Romania, I don’t really think too much about being sick. In fact, when I talk about that miserable road trip, I laugh about it, almost proud of my battle story like an old guy that shows his scars from the war. For that trip, I mostly remember the way Ana Maria, a little orphan who adopted my heart and how she loved me so deeply and purely. We were short term best friends and she taught me so much while we played games, fumbled through language barriers, shared snacks and sang “Miss Mary Mac” way too many times. She probably gave me impetigo. But the suffering is a funny afterthought now. The bible says that Jesus, for the joy set before him, endured the cross, despising it’s shame. We are that joy. He was able to endure the cross because relationship with all of us was on the other side of it. The resurrection pushed the reset button on creation and set about redeeming human suffering and opened the way to know God and enjoy him forever. Jesus felt it was worth it. I am not pretending to have answers for our suffering. While I’ve been writing my gout attack has begun to ease off as my nsaids kick in. My friends are still in pain. I do know that there is joy set before all of us and joy to be found right now. Jesus suffered and still suffers with us. He is not aloof from our pain. “For we do not have a high priest who is unable to sympathize with our weaknesses, but we have one who has been tempted in every way, just as we are--yet was without sin.” Hebrews 4:15. And one day, as Andrew Peterson wrote in his beautiful song paraphrasing C.S. Lewis, “We will look back on these tears as old tales.” Until then, we carry on, supporting one another in love, bearing one another’s burdens, rejoicing with those who rejoice and weeping with those who weep. Please feel free to show off a battle scar in the comments section or share on what suffering has meant to you. I’d love to hear your thoughts. So far, I’ve seen "Super 8" two times. I’d like to see it again. This film has scratched an itch that I’ve had for a long time. It’s no secret that the director, J.J. Abrams (the newer Star Trek, Lost, Alias and...um...Felicity) wanted to make a Spielberg movie from the 80’s. Kids that get caught up in a something way bigger than they could imagine and winning the day with backpacks, bikes, overlapping dialogue and slightly foul mouths. Do you remember that scene from “Ratatouille” where the food critic is whisked back to his mother’s kitchen and the comfort food she made for him? That’s how I feel watching this movie. Suddenly, I’m 13 year old Chris sitting alone in the theater and crying as E.T. is leaving Elliot, Gerty and Michael. From the soundtrack to the beautiful writing and fun adventure, it’s a place I haven’t been too in a while. Part of the story is a movie within the movie. The kids are making a zombie movie to enter into a contest. As the credits roll, you get to watch the finished product entitled “The Case”. It’s awesome. And it made me realize how much of a control freak I am. Let me explain. My sons (especially my oldest) love to make movies. And I have had some involvement in a few of them. I usually end up directing/controlling the ventures I am involved in because, well, I have a mature sense of what would be funny or interesting in scenes. I usually have a little moment when I realize that I’ve taken over the project but sometimes it’s too late. 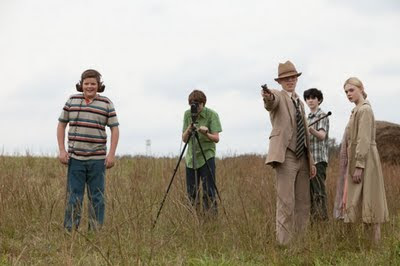 In Super 8, Abrams (and Spielberg) are telling part of their story. They are letting us peak into what it was like when they were kids, running around with a Super 8 camera and dreams of cinematic glory, adventure stories, and scary wonder. These kids are free to make their movie even if it doesn’t come with a mature sensibility. It’s about kids making a movie kids would make. This week, my boys had some friends staying with them and they all saw Super 8 together and then set to making their own movie. I stayed out of it. The way you get good at something is to just do it. To make an attempt at the level you’re at. I have a friend in Canada that is determined to learn to sing songs, write poetry and play guitar. His attempts are not yet perfect but they are awesome. He is reaching, trying, stretching and growing. His poems are insightful, his songs are surprising and his outlook is fresh and creative. He is seemingly free from worry over what others think of him while he grows. I want to be like that. I want to free others to feel like that. I was at a concert festival in Texas listening to Phil Keaggy. This concert seemed to be running by a pretty strict time schedule and Phil’s set got cut short. He was gracious and respectful of the schedule but if Phil Keaggy is playing the guitar, you should just let him play till he’s done. A friend turned to me and said, “Man, sometimes you gotta stifle utility and let art flow!” We laughed so hard and that line became our mantra for creative freedom. And here’s the boy’s movie as they wanted to make it. It's perfect.